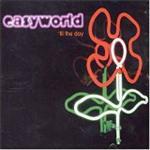 Easyworld are back with their melodic sound on the track 'til the day. This is the first track to be taken from their upcoming album Kill The Last Romantic (released 3rd Feb.). 'til the day has some lovely pianos backed up with strings. Dav's singing his heart out in this track, hopefully the rest of the album is this good! So far, my single of the year... Released on 2cd's and a 7" vinyl with 4 b-sides between them, the b-sides on the 2 cds are very good, I've not heard the one on the 7" yet.